Recently, I have been hearing people in my gaming news feed, like Patrick Klepek at Waypoint, talk about a game called Hidden Agenda. It isn't the first time the game fell onto my radar, coming up briefly in some of the presentations at E3 2017. As someone who has been casually looking out for news on it, I was surprised that it had been released without so much as a peep. 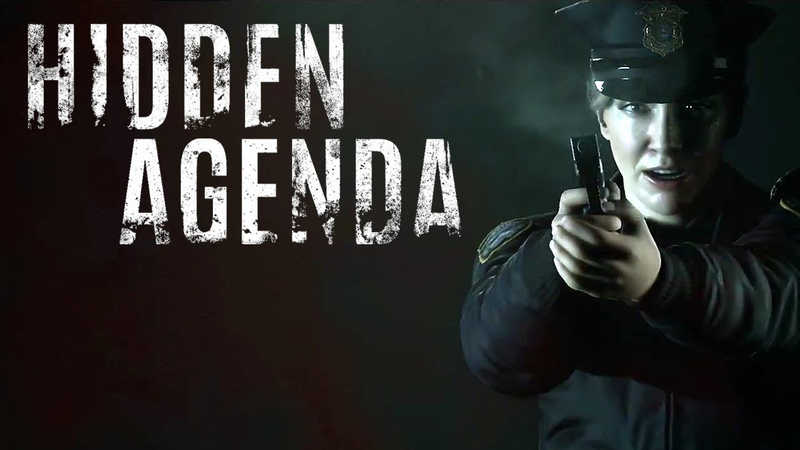 Hidden Agenda is the product of Supermassive Games, the same studio that brought us the surprise smash Halloween hit Until Dawn in 2015. Rather than continue Until Dawn's loving homage to horror movies with another, similar game, Hidden Agenda applies that same sense of genre-awareness to the modern crime-drama. Taking the roles of ace detective Becky Marney and hard-hitting prosecutor Felicity Graves, players attempt to solve the case of the Trapper Killer, who booby-traps their victims’ bodies in order to kill responding officers. As part of PlayLink, Sony's initiative to offer Jackbox-like social games to the PS4, multiple players could play either cooperatively or competitively in order to change the course of the story. These features only work if the mobile devices and the PS4 are all using the same wifi, meaning it is impossible to stream the game to a group of people and play across the internet. And since there's no way I was going to try convincing my family, on Thanksgiving, to crowd around my PS4 and download the Hidden Agenda Mobile App to their phones in order to watch a crime-drama when they could be watching “The Game” instead, I played in solo mode. So rather than focus on how playing it with multiple people impacts it, I am going to talk about Hidden Agenda's place in the genre of “Adventure Games” codified by Telltale and Quantic Dream. Though I did not play with other people, the fact that Hidden Agenda is designed to be played in a social setting forced it to make several concessions in its design. With some exceptions, many of them worked to improve the game overall, and could be easily applied to its contemporaries. As a game meant to be played in at a party, or with a small group of friends, a single playthrough of Hidden Agenda does not take long. My run of the game took slightly longer than 2 hours. While this is might be long for a police procedural, this is completely atypical of a video game storyline from a big budget studio. For Hidden Agenda, this proves to be a boon. I found that the game was significantly more focused than I'm used to for games in this genre. Almost every Telltale or David Cage game I can think of has at least one section where it feels like the game was padded out in order to meet some arbitrary length requirement. Telltale’s The Walking Dead Season 1: Episode 2 and Season 2: Episode 4, and the entire Navajo segment in Beyond: Two Souls all could have been abridged or cut out entirely without significant loss to the story of those games. Hidden Agenda's short length gives it a flow that these games don't necessarily need to have. It is deliberate in how it paces itself, making sure to carefully administer new plot points when they would be most impactful to the story. I remained engaged with the game for the duration of my playthrough, looking forward to the next reveal. That said, Supermassive also remembered that not every scene can be tense or exciting without burning out the audience. They made sure that both the players and the two protagonists had room to breathe after tense or exciting events. Though there is not much in terms of character development, each member of the cast serves their purpose in the narrative, driving the plot forward. If nothing else, Hidden Agenda makes a strong case for the two hour, highly focused adventure game. Story and writing aren't the only way Hidden Agenda separates itself from its contemporaries. As part of the aforementioned PlayLink initiative at Sony, the game does not use a controller. Instead, players download and play the game exclusively through a smartphone application. Using the phone as a touchpad, players move their cursors in order to perform all of their in-game actions. Though this seems like a severe limitation at first glance, limitation is the mother of creativity. The PlayLink UI was leveraged in ways that made me rethink many conventions in the space of the “Adventure” game. Without the use of a controller, specifically an analog stick, the options for how to move the protagonists are slim. Rather than attempt to answer how one could reasonably translate swipes on a smartphone screen to avatar movement, the developers opt to just remove that facet from the game entirely. At no point do the players ever have to ferry their character from place to place, the game handles that for them during cutscenes and story beats. This might sound like a bad thing, but it heavily contributes to the pacing I talked about earlier. The player does not need to worry about who they can talk to for more dialogue or where the designers want them to go to move on to the next segment. Instead, they can focus on the decision making that exists at the heart of the genre. Another important part of being a game intended for social audiences acknowledging that the audience will not be paying attention to story events the whole time. The audience will likely be talking to each other, and may miss some crucial details as a result. I suspect this is why Supermassive Games included a logbook that keeps track of both what choices the players have made so far and what they have learned about each member of the cast. Since I played by myself, this feature wasn't aimed at my style of play, but I did find myself flipping through it to make sure that my understanding of events made sense based on the available clues. I don't advocate that games in the genre start flooding the Apple App and Google Play storefronts with a ton of companion apps just to have a case tracker appended to them. That said, I do see value in having similar systems in other games. The concept is hardly novel: Assassin's Creed is legendary for its use of the in-game database to tie real history in with the game, and many RPGs like Mass Effect and The Witcher have codices on their worlds and lores. When I think about similar mechanics in the Adventure Game space, the only ones that come to mind are Life is Strange and Until Dawn. That’'s disappointing when so many of these games can benefit from having these information storehouses available. I have a distinct recollection of my time with The Wolf Among Us, one of Telltale's best games. Despite how much I enjoyed it, episodes were slow to come out: So slow that I had difficulty remembering a lot of the details, like who knew who and what their motivations were. As for David Cage's offerings, I did not find it easy to follow the stories of Heavy Rain and Beyond: Two Souls, specifically when it came to characters and “why” they were doing what they were doing. Having a log of “the story so far” is no magic salve for David Cage's writing, but it can help the player keep pace when trying to follow along. With no marketing, Hidden Agenda is a game you've probably never heard about until you saw this article. And with all the barriers to entry, Hidden Agenda is a game you probably won't ever play. It's not perfect, but it serves as an interesting case study for lower-cost, more focused content in the video game space. Though it requires users to download a smartphone app and play together in the same room, PlayLink's UI inspired Supermassive to build creative solutions to its limitations, which can be ported to other games in the genre. It's a tragedy that Sony hung this little gem out to dry.